The move to grant AOP or NOC comes in the wake of the ministry and the DGCA considering allowing non-scheduled air operators and air charter firms to convert to scheduled operators to fly on routes not touched by the existing scheduled airlines. 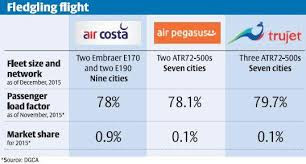 Six new airlines are likely to fly in the Indian sky in the coming months with the government giving flying licence to four of six companies which had sought permits for launching scheduled, private or charter air operations. While AirAsia India, Ligare Aviation Limited, Quickjet Cargo Airlines and LEPL Projects Limited have been granted the Air Operator’s Permit (AOP) or the flying licence, the two pending cases are those of Tata-SIA Airlines Limited and Air Pegasus Limited, Minister of State for Civil Aviation G M Siddeshwara has said. While AirAsia India has started its operations, Tata-SIA Airlines, a 51:49 joint venture between Tata Sons and Singapore Airlines, has announced plans to launch flights by September-end or October. Recently, the Directorate General of Civil Aviation (DGCA), which is in the process of examining Tata-SIA’s application for grant of AOP to launch a full-service carrier, recently dismissed objections from the Federation of Indian Airlines against it. The approval for an AOP, when granted, would be subject to the orders of the Delhi High Court in a case challenging foreign direct investment in new Indian carriers. Two other airlines, Air Carnival and Zav Airways, have been granted the initial No Objection Certificate (NOC) by the Civil Aviation Ministry to start scheduled regional services. While Air Carnival proposes to operate in the Southern region, Zav Airways would fly in the Northeastern and Eastern regions, officials said. Earlier, Ministry officials said NOC has also been granted to AirOne Aviation, Zexus Air Limited, Premier Air and Turbo Megha. Non-scheduled operator AirOne, headed by a CEO of the erstwhile Air Sahara, is understood to have plans to launch a scheduled airline. Getting an NOC is the first step towards launching flight operations. The airline companies have to then apply to DGCA for the AOP, complete all necessary requirements and formalities and satisfy the aviation regulator of their capability to launch flight operations. 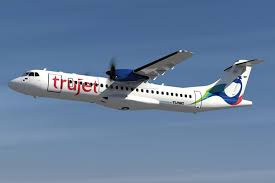 Civil Aviation Minister Ashok Gajapathi Raju recently said such moves were aimed at promoting air travel to unconnected destinations. He also said that regional airline services needed to be supported by state governments also as these promoted regional connectivity.